Something hit us ... The crew is dead ... Help us, please! Please help us! 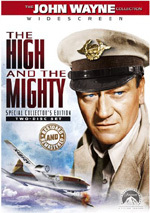 A mid-air collision involving a a small plane and a commercial jetliner leads to potential disaster, as a plane loaded with passengers and no pilot becomes the worst nightmare for a flight attendant tasked with flying the craft. In 1970, Airport launched the string of disaster movies that populated screens in the Seventies. Big hits like The Poseidon Adventure, The Towering Inferno and Earthquake all made their mark before we’d finally get another Airport movie. That franchise picked up steam again in 1974 with Airport 1975. Businessman Alan Murdock (Charlton Heston) strings along his long-time girlfriend, flight attendant Nancy Pryor (Karen Black). She wants to talk about their relationship but he avoids this. He eventually promises to talk when they both make it to LA. We meet some other passengers on the Columbia aircraft. Gloria Swanson (herself) returns from a meeting with the Supreme Court while sick young Janice Abbott (Linda Blair) needs a kidney transplant in California. Others include nuns Sister Ruth (Helen Reddy) and Sister Beatrice (Martha Scott), partying conventioneers Sam (Jerry Stiller), Bill (Norman Fell) and Arnie (Conrad Janis), struggling actor Barney (Sid Caesar) and boozehound old lady Mrs. Devaney (Myrna Loy). The roster includes Helen Patroni (Susan Clark) and her son (Brian Morrison), the wife and son of Joe Patroni (George Kennedy), one of the heroes of the first flick. We also get to know Captain Stacy (Efrem Zimbalist Jr.), the plane’s pilot, and co-pilot Urias (Roy Thinnes) and navigator Julio (Erik Estrada). In the meantime, solo pilot Scott Freeman (Dana Andrews) decides to leave Gallup New Mexico despite inclement weather. He also seems a little worse for wear, but he chooses to make this unaccompanied flight anyway. He needs to be back for a meeting so he takes risks. Bad weather affects the Columbia flight as well. Fog closes LAX and they get shifted to Salt Lake City. The same thing happens for Freeman, so he heads toward Utah as well. Not good! Freeman has a heart attack and flies his plane right into the 747’s cockpit. This kills Julio and Urias and severely injures Stacy. This leaves Nancy in charge. Patroni gets wind and acts as part of the rescue, and we find out that Murdock is an expert in the operation of 747s, so Patroni brings him on the team. The movie follows these efforts and their results. Flicks like this always require audience members to suspend disbelief. However, most don’t go as far as 1975, which absolutely depends on the annihilation of disbelief for the viewer to enjoy it at all. Where to start? I suppose the concept that there’s no one on the plane more qualified to fly it is a good place to begin. Of all the passengers, there isn’t anyone with some experience at the helm of a plane – not even a Cessna? That seems tough to accept, but then again, in a world where Gloria Swanson a) plays herself, and b) meets with the Supreme Court, I guess we can swallow this. Scads of coincidences abound, and the film takes some odd liberties. When Freeman’s plane impacts with the 747, none of the air traffic controllers seem very concerned, and the folks on the jet themselves remain pretty laidback about things. On some occasions, they actually leave the cockpit unattended to deal with other matters! Nancy occasionally freaks out, but only as a plot device. Oddly, the folks on the ground often exhibit much more passion than those at risk of death. Actually, the primary examples of this come from Heston and Kennedy. They give master courses in overacting here, as they play their roles in three ways: angry, angrier, and angriest. I half expect Kennedy to yell at his ham sandwich for being too tough. At least 1975 gets going a lot more quickly than the extremely slow-paced Airport. As I noted when I reviewed it, the original flick was more soap opera than disaster movie. It concentrated on its bland character portraits and lacked much excitement. For all its stupidity, at least 1975 delivers those particular goods. The filmmakers had the good sense to concentrate on the disaster elements. The crash takes place less than halfway through the movie. That means enough time to deliver reasonable exposition, but not enough for us to get bored. Don’t get me wrong; I don’t think these movies should immediately launch into hysterics with little to no build-up at all. The subsequent Airport flicks take that path, and they become less and less satisfying. I just don’t want to have to suffer through all the nonsense seen in the original Airport, at least not unless the rest of the effort presents real excitement. Boy does 1975 require us to accept a lot of idiocy along the way, though. We find a very Seventies sense of sexual politics with some insanely heavy-handed flirting. It’s also amusingly convenient that Janice brings along a guitar so pop star Reddy can play her a tune. The whole plot device of the sick girl in desperate need of medical attention seems especially shameless, though for some bizarre reason, the film largely ignores it. Clearly it sets up the urgency of this matter, but it never invests much in it during later portions. Other characters come and go without much notice. But who cares? We watch movies like this for their disaster elements, and Airport 1975 gives us what we want – at least to a moderate degree. It’s insanely cheesy, and not just because of the garish Seventies décor and fashions. I think a piece of fromage like this will likely appeal to fans of camp more than anyone else, but disaster aficionados may enjoy it as well. Airport 1975 appears in an aspect ratio of approximately 2.35:1 on this double-sided DVD-14; the image has been enhanced for 16X9 televisions. A mostly satisfying transfer, 1975 came without extreme problems. Sharpness was a little erratic. Most of the time the movie displayed acceptable clarity and definition. However, some shots came across as marginally soft. I saw no problems with jagged edges or shimmering, and edge enhancement was minor at best. Source flaws created occasional concerns. As expected, a lot of these resulted from effects shots, but not all of them. Periodic examples of specks, marks and grit moderately marred the presentation. Overall, the flick was reasonably clean, though. Colors seemed satisfactory, as they displayed the movie’s garish Seventies styles. The tones didn’t jump to life, but they were acceptably accurate. Blacks were fairly deep and firm, though they occasionally took on a slight bluish tint. Shadows were also a bit murky, but not badly so, as they mostly depicted the low-light shots with good clarity. This wasn’t an outstanding transfer, but it succeeded well enough for a “B-“. As for the monaural soundtrack of Airport 1975, the biggest problem related to speech. Too much of the time the dialogue came across as brittle and edgy. The lines stayed intelligible but were too distorted. Though the score sounded a bit dull, it seemed reasonably full, and it offered pretty nice low-end. The same came through with the effects. Highs were a bit lackluster, but the track kicked in with some decent bass. Other than a smidgen of hiss, no source flaws appeared. I thought this was a fairly average soundtrack. Almost no extras appear on this set. We get the movie’s trailer, and a spoiler-laden one at that. Don’t watch it unless you’ve already seen the film. Airport 1975 goes down as the best of the series, though that doesn’t say a whole lot. Despite rampant campiness and stupidity, the movie manages enough silly energy to remain entertaining. The DVD presents decent picture and audio but lacks substantial extras. It’s a goofy piece of fluffy fun. 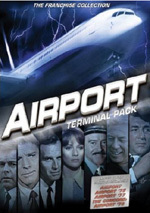 Note that Universal currently makes Airport 1975 available only as part of the four-film Airport Terminal Pack. 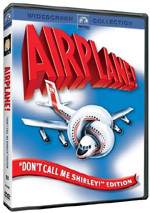 This also includes the original Airport plus sequels Airport ‘77 and The Concorde… Airport ‘79. Some may grouse that you can’t buy the flicks individually, but with a list price of less than $20 for all four, it’s hard to complain.